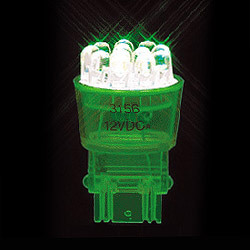 Made up of twelve red super bright LED bulbs; used in various vehicles as direction light. (1) Emitting color: ultra green. (2) Forward voltage unit (V): 13.2. (3) Totality luminous intensity unit (LM): 17.5. (4) Single LED axial intensity unit (mcd): 21500. (5) Dominant wavelength unit (nm): 525. (6) Viewing angle unit (deg): 14. (7) Color temperature unit (K˚): 7400. 2. Part NO: test condition..
(1) Emitting color: power: 1.05W. (2) Forward voltage unit (V): Current: 80mA. (3) Totality luminous intensity unit (LM): IF=20mA. (4) Single LED axial intensity unit (mcd): IF=20mA. (5) Dominant wavelength unit (nm): IF=20mA. (6) Viewing angle unit (deg): IF=20mA. (7) Color temperature unit (K˚): IF=20mA.